NOTES: I follow the "Mapleshade" or purist form when I record sample sounds here at the Garage. All of the sounds on this page are recorded "straight". That is to say, I use no eq, no compressors, no gates, no limiters... no milking of any sort. The guitar cable used is an eighteen foot GeorgeLs with unplated ends, the microphone cable used is a run of the mill Dayton cable with standard Neutrik NC3FX and NC3MX connectors. The mic cable is plugged into a Mackie analog 8-bus mixer with the eq in the "out" position (e.g. I am just using it as a clean mic preamp) and the output of the Mackie is run directly into an Apple Powermac or Panasonic SV3700 depending on how many mics were used. All of the sounds are recorded in TheAirtightGarage itself, with the amplifier on the floor, and its front is facing along the same axis as the longest wall of the building. TheAirtightGarage has no special acoustical treatment. That being said, all of the amplifiers will exhibit a larger more well rounded sound in a larger area, as the Garage is probably smaller than your average venue. I have included the sample sounds here in mp3 format, and also in ogg vorbis format. All tracks are recorded at standard CD quality (44.1kHz/16b), and have not been up or down sampled. If your internet connection is very slow, or if you have trouble downloading, email or call and I can send you a CD in raw format of all of my sample sounds. Please note, since most computer speakers are no where near the quality of say, your average studio monitor, these tracks are really to give you an idea of the sound... for critical listening a good set of monitors or studio headphones is recommended. Note Gary Granger of 3LC did most of the tracks below (see notes). You can learn more about Gary here. Here is a short clip from guitarist Craig Feazel. Here is a short clip from Hunter Perrin. Here is a short clip from guitarist Mark Clark of the GreenLight Caravan. These are some sound samples through the Nora courtesy of Guillaume and one of his guitars. The setup is the same as the other sounds recorded at the garage. These are some very down and dirty quick sound samples from the Mary Jane that were done when we had the mics out. As usual, there are no effects, eq, etc, but this one was done without the large space of the shop. The mics are the same as with the other sounds, the AKG in the front and the large diagphram farther out. Gary Granger is playing guitar on all sample sounds of the Candy amplifier. Gary Granger is playing "Lucky", a custom built swamp ash body, maple neck, rosewood fretboard, stainless frets guitar with Bill Lawrence Tele picks and Gotoh Locking Kluson tuners. The gutiar was custom made by Dr. Gerard Beyt of Saint Martinville, Louisiana. All sounds copyright Gary Granger, 2005. The samples were taken with the aforementioned setup (top of this page) using one AKG D9000 microphone five inches from the front baffle (L channel) and the other microphone (R channel) is a cheapie large diagphram condenser microphone located five feet from the front baffle. Note Tracks 1, 2 and 7 are the clean channel. The rest are of the mean channel. Sound Samples from the Barbara, played through the Betsy. The samples were taken with the aforementioned setup (top of this page) using one AKG D9000 microphone five inches from the front baffle (L channel) and the other microphone (R channel) is a cheapie large diagphram condenser microphone located five feet from the front baffle. The Barbara is plugged into the Betsy via one 1m GeorgeL cable. The guitar cord used is, as always, a standard 6m GeorgeL cable. Gary Granger (of Three Legged Chicken) is playing guitar on all sample sounds of the Betsy. These are random sample sounds from an impromptu listening session. All sounds copyright Gary Granger. The samples were taken with the aforementioned setup (top of this page) using one AKG D9000 microphone five inches from the front baffle (Lchannel) and the other microphone (R channel) is a cheapie large diaphragm condenser microphone located four feet from the front baffle. The Betsy is a "half way" tonebuster in that the first coupling caps were upgraded. The first four tracks are a strat, the last are an Ibanez Artist. Gary Granger (of Three Legged Chicken) is playing guitar on all sample sounds of the Tonebuster115 amplifier. All sounds copyright Gary Granger. The samples were taken with the aforementioned setup (top of this page) using one AKG D9000 microphone five inches from the front baffle (Lchannel) and the other microphone (R channel) is a cheapie large diaphragm condenser microphone located four feet from the front baffle. 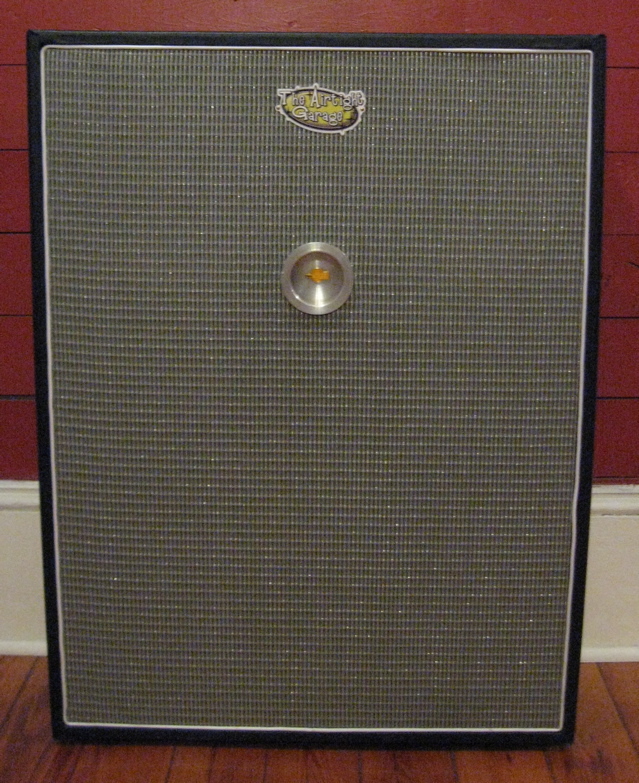 The tonebuster115 is a standard unit with 6L6 output tubes installed. The first two tracks are recorded with a Strat, the last two tracks are with the Ibanez Artist. Track 1 is nearly wide open on the volume control. Gary Granger (of Three Legged Chicken) is playing guitar on all sample sounds of the Bunny amplifier. All sounds copyright Gary Granger. The samples were taken with the aforementioned setup (top of this page) using one AKG D9000 microphone six inches from the front baffle (L channel) and the other microphone (R channel) is a cheapie large diaphragm condenser microphone located five feet from the front baffle. This Bunny is a standard unit, ceramic magnet speaker, Sovtek 12AX7LPS, JJ 6V6GT and Philips 5Y3GT. All of these samples were recorded with an Inabez Artist semi-hollowbody guitar. The Bunny is running wide open (maximum volume) for these three clips. Same setup as above, but now with the Bunny volume control set to 6. Gary Granger (of Three Legged Chicken) is playing guitar on all sample sounds of the Emily amplifier. All sounds copyright 2005 by Gary Granger. First up, a Strat, modified by Tims Guitar Workshop; Emily settings are: Volume 4, Tone 5. Next up is an Ibanez, same mic position, Volume on Emily set to 2, Tone 5. Next is the full archtop hollowbody Washburn, Volume on the Emily is at 3, tone control the same. Lastly, we have a cheap Les Paul, with even cheaper pickups. Nothing changed on the Emily for this one.